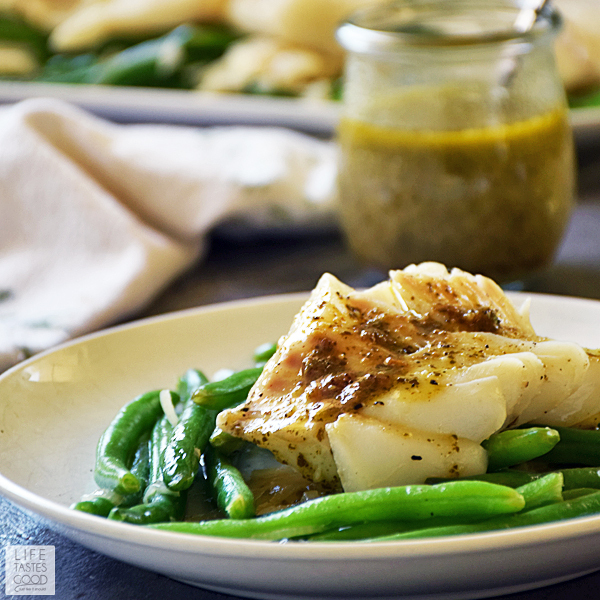 Poached Cod with Pesto Wine Sauce and green beans is the easiest recipe you're not making but definitely should be. In addition to cooking in one skillet and on the table in just 15 minutes from start to finish, this recipe is also good for you and packs a big flavor punch! Today, the Sunday Supper Tastemakers are sharing a collection of Healthy Green Recipes to enjoy on St. Patrick's Day. Growing up in an Irish family we always wore our green or suffered the dreaded pinches all day long. It was believed wearing green made you invisible to leprechauns who would pinch anyone they could see, so naturally, this folklore gave my family the right to pinch anyone not wearing green as a reminder to get your green on before the leprechauns got you. This year I'll be wearing green on my plate too. No pinches for me! 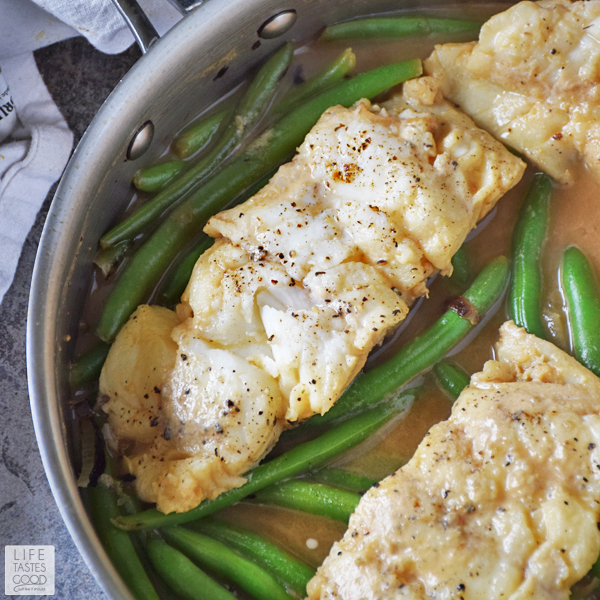 In addition to my Poached Cod with Pesto Wine Sauce and green beans, our Sunday Supper recipes range from breakfast to dessert and everything in between. Our healthy green recipes will keep you satisfied all day long. This recipe is relatively low in carbs with no added sugar. It is low in calories and gluten free too. Cod is an excellent source of vitamin B12, selenium, phosphorus and protein. It is also a very good source of choline as well as a good source of niacin, potassium, vitamin B6, molybdenum, pantothenic acid and omega-3 fatty acids. Look for wild-caught U.S. Pacific cod or Atlantic cod from Iceland and the northeast Arctic. Green beans are a good source of copper, vitamin B1, chromium, magnesium, calcium, potassium, phosphorus, choline, vitamin A, niacin, protein, omega-3 fatty acids, iron, vitamin B6 and vitamin E.
As I mentioned above, this recipe is the easiest recipe you aren't making. There is very little prep and it cooks quickly all in one skillet making clean up a breeze too. 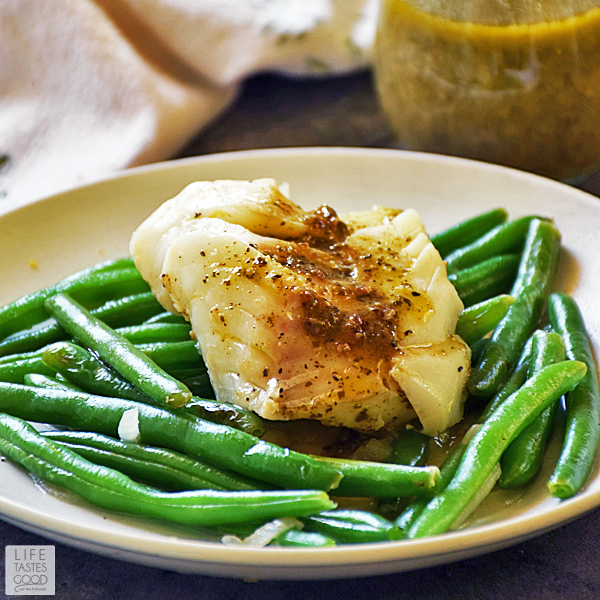 The pesto wine sauce has a unique flavor that compliments the fish nicely, and the green beans are cooked perfectly with just a little bit of crunch to them. Using 1/2 white wine and 1/2 chicken broth in the poaching liquid infuses wonderful flavor into the green beans. The entire meal is a treat and so healthy too. I feel like a full-fledged grown up when I enjoy this easy, healthy, and quick recipe for dinner. Prep the ingredients first to have them handy as this recipe moves quickly. Trim the green beans and slice the shallot. Season the fish and measure out the liquids. Use a skillet with a tight fitting lid. I use a stainless steel skillet for this recipe, but a cast iron skillet will work too if you have one with a tight fitting lid. Set the skillet over mid-high heat while prepping the ingredients. It will be ready to add the oil and then the vegetables once everything is prepped. Use a large, flexible fish turner when removing the fish from the skillet. The fish will be tender and flaky, so it helps to have the proper spatula to help remove it without it falling apart. Serve with fresh lemon wedges. A squeeze of lemon brightens up this dish nicely. 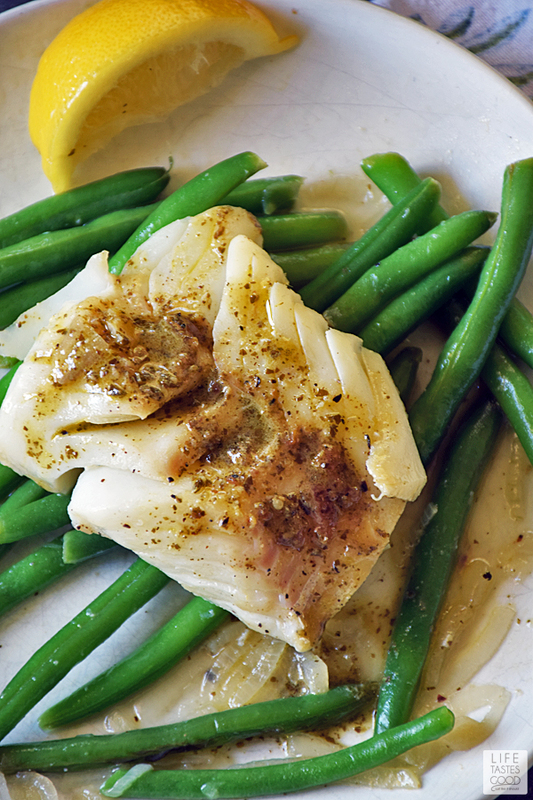 Poached Cod with Pesto Wine Sauce and green beans is the easiest recipe you're not making but definitely should be. Heat skillet over mid-high heat. Add 1 tablespoon olive oil. Add thinly sliced shallot, green beans, and 1/2 teaspoon kosher salt. Cook, stirring, for about 1 minute until the shallot begins to soften. Combine 1/2 teaspoon kosher salt and 1/4 teaspoon black pepper and use this mixture to season both sides of all fish pieces. Place fish on top of the green beans in the skillet. Add 3/4 cup water, 3/4 cup white wine, and 1/2 teaspoon chicken base to the skillet. Gently stir the chicken base to dissolve. Cover. Increase heat to high and cook for 3-5 minutes until the fish is cooked through. Note: You can substitute 3/4 chicken stock in place of the water and chicken base combo. Using a flexible slotted spatula, carefully transfer the cod and green beans to the serving dishes. Divide the green beans and fish between 4 plates. Heat the liquid in the skillet over high heat for 3-5 minutes until reduced to about 1/2 - 3/4 cup liquid. While reducing the liquid, use a spatula to scrape up any browned bits on the bottom of the pan. Remove from heat and stir in 1/4 cup pesto. Pour pesto wine sauce over fish and serve with lemon wedges. Enjoy! Recipe inspired by EatingWell. I like the original recipe, however, I felt it could be better, so I swapped out 1/2 of the chicken broth for white wine and opted to use a chicken base and water mixture in place of the the other half of the broth. This simple change deepened the flavor of this dish and took it to a new level of deliciousness. Absolutely beautiful! I love that sauce. I definitely have a soft spot for poached fish, and this looks so juicy and moist how could it be wrong? Perfect recipe....easy, peasy and delicious. I can always use a good recipe for fish like cod, thanks Marion! That cod looks perfect! And I love that you served it with green beans. This was so easy and delicious. Switched up asparagus in place of the green beans. Definitely a keeper! Thanks! Making this tonight!! Looks delicious! Is it more flavorful to sub in the 3/4 chicken stock verses the water? I hope you love it as much as we! You can absolutely use chicken stock if you have it on hand. It should give it a little more depth. You might want to cut back in the salt a bit & then just give it a taste and more little by little as needed. Enjoy! !